In onderstaande database hebben wij al onze kennis en ervaring gezet over het retrofitten van koplampen met Xenon projectors. Wij vullen deze database met regelmaat aan met nieuwe informatie. Wat als uw voertuig niet in onderstaande tabel staat? Wij hebben dan hoogstwaarschijnlijk geen ervaring met deze koplamp. We zijn net als u ook benieuwd naar de mogelijkheden en zoeken dit graag samen met u uit. Voor een gemakkelijke installatie van bijvoorbeeld de Mini H1 of D2S, is de belangrijkste vraag of de koplamp voldoende ruimte te bieden heeft. U kunt de diepte van de koplamp gemakkelijk opmeten met een meetlint via de achterzijde van de koplamp door de opening die ontstaat als de lamp verwijderd wordt. De afmetingen van de projectors vindt u onder Specs bij de verschillende projectors. Indien bekend, vermelden wij ook de soort sealing die gebruikt wordt in de koplamp. Er zijn grofweg 2 soorten waar koplamp behuizingen waterdicht gemaakt mee worden. Deze kit is van een vrij zachte samenstelling. Het wordt zacht als het verwarmd wordt. Koplampen die voorzien zijn van butyl zijn gemakkelijk te openen door de koplamp in zijn geheel te verwarmen in een oven of in een stevige doos met een heatgun. Dit is een kit van permanente aard. In tegenstelling tot butyl, wordt het in de meeste gevallen niet veel zachter als het verwarmd wordt. Koplampen die gesloten zijn met permaseal zijn over het algemeen wel goed te openen, het zal wel meer tijd kosten om de kit los te werken. Permaseal moet na het openen verwijderd worden uit de kanalen van het koplamp en van de lens, en voorzien worden van nieuwe butyl. Meer informatie over sealings vindt u bij onze butyl sealing. (same headlights) 2006-2011 permaseal These headlight are from the category of "easiest to retrofit". These Bosch/AL headlights are already equiped with projectors. The projectors can easily be removed from the rear opening of the headlight, it's not necessary to bake them open. The original H7 halogen or D1S xenon projectors are okay, but nothing spectacular. The reflectors from the Bosch/AL projectors are known to burn after the years, reducing the light output. We have 2 Bi-xenon options to replace the projectors with. The first option is the D2S E46 Bi-xenon projector which is a direct replacement, without any modification. The second option is the Mini H1 projector with a special RFL made bracket for easy bolt on fitment. Giulietta 2010+ These headlight are from the category of "easiest to retrofit". These Bosch/AL headlights are already equiped with projectors. The projectors can easily be removed from the rear opening of the headlight, it's not necessary to bake them open. The original H7 halogen or D1S xenon projectors are okay, but nothing spectacular. The reflectors from the Bosch/AL projectors are known to burn after the years, reducing the light output. We have 2 Bi-xenon options to replace the projectors with. The first option is the D2S E46 Bi-xenon projector which is a direct replacement, without any modification. The second option is the Mini H1 projector with a special RFL made bracket for easy bolt on fitment. A2 1999-2005 perma/butyl H7 headlight, perfect for Mini H1 projectors. This headlight uses halogen projectors for low beam. To remove the projectors you need to bake and open the headlight. We have brackets available to mount other projectors, A3 8L pre-facelift. The facelift model also uses a projector, we have a kit available, please mail for more info. A3 8V 2012+ permaseal Mini H1 projectors for the H7 reflector housings. A4 B6 2001-2004 permaseal For the B6 Audi A4 there are 3 different headlight units, all manufactured by Valeo. Every unit is relatively easy to retrofit. Check out 2 video's we made for removing the headlight unit. Valeo H7 2,5 inch halogen. Check out the video for replacing the projectors. Valeo D1S 2,5 inch single xenon. These are some crappy projectors with a lousy output. Replacement can be done with the same kit as for the H7 halogen unit, but you'll need new ballasts as well. A4 B6 convertible 2002-2006 permaseal The convertible headlights are made by a different manufacturer, ZKW, and come in 2 flavors: halogen and single xenon. ZKW H7 halogen. Not really a spectacular projector, the Mini H1 projector will more than double the light output compared to the H7 halogen output. ZKW D2S single xenon. Like with the BMW 3 E46, headlight manufacturer ZKW made a huge mistake to produce plastic reflector bowls. These bowls will literally burn so badly that holes may appear. Unacceptable, but it's fixable with our B6 MH1 convertible kit. One of our most popular video's on Youtube is for the B7 headlight. In most cases it's necessary to grind away some material of the H7 fitting to expose enough thread of the Mini H1 projector to secure the nut far enough. The Iris shroud fits just perfect in this reflector, making it look like it's OEM. Please note that new headlights (recently manufactured) for the B7 are permasealed because of a recent change of factory. The units that came installed on the car are always sealed with butyl. A4 B8 2008+ butyl The B8 A4 halogen headlight uses H7 bulbs, so it's perfect for the Mini H1 projector. A6 C5 1997-2004 butyl There are 2 different headlights. Most C5's have single halogen or single xenon 2,5 inch lens projectors. This projector can be replaced with special projectors and brackets and our FX-R 4.0 2,5"projectors. This is also the correct kit for the allroad models. The facelift model has a Bi-xenon headlight with a larger 3 inch projector lens. The facelift model uses Hella E55 projectors that can be replaced with our EvoX-R projectors. Xenon headlight uses EvoX-R projectors. Pre-facelift an both facelift model without AFS system is very easy to retrofit. Projector can be removed from rear of headlight without opening headlight. For pre-facelift models with AFS, the headlights need to be opened to replace the original Hella projector. Based on customer information the facelift model without AFS can be replaced from the rear. Facelift is from 2008. You will also need the D2S to D2S adapter. The halogen headlights are H7, can are perfect for a Mini H1 install with Iris shrouds, check out the video. Some facelift models have D3S projectors, bulbs and ballasts. Our EvoX-R 2.0 can hold D3S bulbs and would be a good replacement, ask for the possibilities by email. A8 1999-2002 The xenon headlights use the Bosch single xenon, they can be replaced without opening the headlight with our MH1 kit. Bosch/AL H7 halogen reflector. E46 MH1 kit makes this headlight look and perform like OEM Bi-xenon. Some grinding on the fitting might be necessary to expose enough thread to secure the nut. The applies to the E46 compact, only this one uses E46-R extended shrouds. Video. Bosch/AL Bi-xenon 3,0 inch projector. Even the praised E46 Bi-xenon D2S projector will loose it's true shine after the years and become dull. Replacing the projector by a new and fresh E46 projector is the way to go. Video. Bosch/AL single xenon 2,5 inch projector. This small D2S projector will also loose it's shine after the years up to the level of dramatic performance. We've designed a bracket to fit a Mini H1 in it's place. ZKW H7 halogen reflector. All our E46 MH1 kits come with special made ZKW adapters, making grinding unnecessary. The E46 MH1 kit makes this headlight look and perform like OEM Bi-xenon! Video. ZKW Bi-xenon 3,0 inch projector. You'll find dozens of topics about this headlight. Actually all these projectors will burn because the projector bowls are made of plastic. Fortunately we found a solution: the ZKW E46 kit. Video. 3 E46 coupe convertible 2002-2007 butyl The pre-facelift coupe has the same headlights as the sedan and wagon. The facelifted headlight has different units designed by Bosch. The 2,5 inch projectors used are H7 based for halogen or D2S for Bi-xenon. The E46 projector is the way to go to retrofit this headlight. If you prefer the Mini H1, that's also available with a special RFL made bracket for direct fit. 3 E90 E91 2005-2008 permaseal The E90/E91 headlights are not very easy to open. Like the E46, these are made by ZKW but also by Bosch/AL. When opened, these headlights are perfect for a Mini H1 retrofit with E46-R extended shrouds. Adding some Led angel eyes is also not a bad choice to join with the latest BMW models! 3 E92 E93 2006-2010 butyl These headlights are perfect for a Mini H1 retrofit with E46-R extended shrouds. Adding some Led angel eyes is also not a bad choice to join with the latest BMW models! 3 F30 2012+ permaseal Like the other 3 series this is also a good candidate to retrofit with Mini H1's and E46-R shrouds. The shrouds will need a bit of trimming to fit nicely in the reflector. In this Hella headlight the EvoX-R projector will be a direct replacement without any modifications. FX-R 3.0 is also a good option, but will need custom mounting. The 2003 headlight uses a different permasealing which is pretty hard to open. Bosch/AL single xenon 2,5 inch projector. This small D2S projector will loose it's reflective layer after the years, up to the level of dramatic performance. We've designed a bracket to fit a Mini H1 in it's place. Contact us to order. EvoX-R's are also a possibility. 7 E65 2002- permaseal Hella headlight with E55 Bi-xenons. EvoX-R could replace them, if you can manage to open the headlight. Cruze 2008+ permaseal H4 headlight, perfect for Mini D2S projectors or Mini H1 projectors. Tough kind of permaseal, takes patience to open headlights. C3 2003-2009 butyl H7 reflector, perfect for Mini H1 with mini gatling gun or larger shroud with modification. C3 2009-2016 permaseal H7 reflector, perfect for Mini H1 with mini gatling gun or larger shroud with modification. We recommend to use DEPO headlights, the permaseal of the OEM headlights is too hard to open. C5 2001-2005 butyl H7 reflector. Perfect for Mini H1 with a mini gatling gun shroud, or a larger Ocular shroud for example. Ram 2002-2008 butyl 9007 halogen headlight, perfect for a direct fit of the Mini H1 projectors with large shrouds like Apollo. Panda 2003-2012 permaseal A pretty spacious headlight, a perfect candidate for the Mini D2S 3.0 since it's originally H4 based. Fiesta MK6 2002-2008 butyl H4 headlight, perfect for the Mini D2S 3.0 Bi-xenon projector. Fiesta 2009-2012 permaseal Hella projector headlight. Can be replaced by the EvoX-R.
Civic 2006-2012 Mini H1 projector with the Mini Gatlin Gun would fit. But needs customization. See the link for what kind of adjustments needs to be made. Prelude 1997-2001 butyl H1 headlight. Mini H1 projector fits with some modification to the reflector. X type 2001-2007 butyl Hella projector, we have a direct replacement of this projector. Contact us for info. XJ350 2003-2009 Uses the same infamous projectors as the A4/S4 B6: Valeo D1S Bi-xenon 3 inch. They are very easy to replace, they can be removed from the rear side of the headlight without opening it. The retroquick kit for the S4 fits perfectly in this Jaguar as well. Thesis all Hella EvoX-R is a direct replacement. Very easy to replace through the rear of the headlight. Range Rover 2002-2010 butyl Headlights manufactured by Hella and Bosch. On the Hella headlights, the EvoX-R is a direct fit, on the Bosch headlights, the E46 Bi-xenon is a direct fit. 2 2007-2014 butyl H4 reflector based headlight, perfect for the Mini D2S 3.0 projector. C-Class W204 2007-2014 Already a projector based headlight. The Bosch projector can be replaced by our E46 Bi-xenon projector. We also have another option, the Mini H1 with a special bracket. The W211 E-Class pre-facelift headlight is made by Hella and uses the E55 projectors. These projectors are known to burn. It can be replaced directly by the EvoX-R projector. We also advise to buy the D2S-D2S cables because a lot of times the original igniter won't fit anymore. Some facelift models have an adaptive light system / projector for which we don't have a solution. There are also facelift models with regular bi-xenon projectors which can be replaced bij the EvoX-r.Facelift is from 2006. E-Class W212 2009-2012 permaseal The W211 E-Class headlight is made by Hella and uses the E55 projectors. These projectors are known to burn. It can be replaced directly by the EvoX-R projector. ML320 2002-2005 The ML320 headlight is made by Hella and uses the E55 projectors. These projectors are known to burn. It can be replaced directly by the EvoX-R projector. ML320 2005-2011 The ML320 headlight is made by Hella and uses the E55 projectors. These projectors are known to burn. It can be replaced directly by the EvoX-R projector. Baking the headlight is not necessary. SL-Class R230 2001-2005 Already a projector based headlight. The Bosch projector can be replaced by our E46 Bi-xenon projector. The Mini Cooper does not provide enough depth to accomodate the Mini H1 projectors. You'll need to adjust the reflector to mount them. The headlights made by AL are sealed with butyl. Eclips 3G 2000-2005 butyl H4 reflector based headlight, perfect for the Mini D2S 3.0 projector with a shroud of the Apollo generation. Pathfinder R51 2004-2012 butyl Large H4 reflector headlight, perfect for a Mini D2S 3.0 projector retrofit. X-Trail T30 2001-2007 butyl H4 reflector headlight, perfect for Mini D2S projector retrofit with Apollo shrouds. Corsa D 2006+ permaseal H7 reflector with round reflector. Mini H1 fits perfectly. Omega B2 1999-2003 The xenon untis have allready Hella projectors which can be replaced by our FXR 4.0 projector. The replacment kit is the same as for the Audi A6 C5. Vectra B facelift 1999-2001 permaseal H7 reflector perfect for Mini H1 projectors with a smaller shroud like the Mini Gatling Gun. Vectra C facelift 2006-2009 These headlights have a original Valeo D1S projector. Vivaro 2006-2014 permaseal Large H4 headlights, perfect for a Mini D2S 3.0 retrofit with larger shrouds like Apollo. Zafira B 2005-2011 permaseal H7 reflector with round reflector. Mini H1 fits perfectly. 307 2001-2007 permaseal The pre-facelift headlight has a perfect H7 reflector for the Mini H1 projector. The facelift headlight already has projectors we developed a kit for it. 407 2004-2010 permaseal Projector based headlight. Mini H1 projectors could fit with a custom bracket. Clio 3 2006-2009 permaseal The Valeo D2S xenon headlights use the exact same projectors as the Audi A4 B6. They can be replaced by Mini H1's with brackets. The H1 bulbs can be connected to the OEM ballast with D2S to AMP adapters. Espace 3 1997-2002 butyl The OEM D2S valeo xenon projector can be replaced by a special kit we designed. Butyl headlights needs to be opened to replace projector. Megane 2003-2009 permaseal H7 reflector, perfect for Mini H1 with a small shroud. The OEM xenon projetcor be can be replaced by our Mini H1's with brackets. The H1 bulbs can be connected to the OEM ballast with D2S to AMP adapters. Butyl headlights needs to be opened to replace projector. Safrane 1997-2000 butyl The OEM D2S valeo xenon projector can be replaced by a special kit we designed. Butyl headlights needs to be opened to replace projector. Traffic 2006-2014 permaseal Large H4 headlights, perfect for a Mini D2S 3.0 retrofit with larger shrouds like Apollo. Twingo 2007-2014 permaseal Large H4 reflector headlight, perfect for a Mini D2S 3.0 projector retrofit. 9-3 2002-2007 Hella headlights, EvoX-R is a direct replacement. The D2S to D2S adapter is needed to use your OEM ballasts. 9-5 2002-2005 butyl The original xenon headlight has the Valeo D1S, which are among the worst of projectors ever made. There is not a replacement option yet, but we are working on it! Alhambra 2000-2009 Original xenon headlight uses Bosch single xenon 2,5 inch projectors. These can be replaced from the rear. We have a special kit available with Mini H1 projectors, to restore the light output again. E-mail to order. Exeo 2009-2003 permaseal H7 reflector, perfect for Mini H1 projector with a medium sized shroud like Iris. Leon 1P 2005-2009 permaseal H7 reflector halogen headlight. The reflectors are not exactly circular, but the Iris shroud fits nicely in our opinion. Mii 2011+ permaseal Large H4 reflector headlight, perfect for a Mini D2S 3.0 projector retrofit with medium to larger sizes shrouds. Similar to Skoda Mii and VW Up. Because of the though permaseal some people will cut off a part on the backside of the headlight. ForFour 2004-2006 butyl Already a projector based headlight. The Bosch projector can be replaced by our E46 Bi-xenon projector. In that case you'll have to bake the headlight. If you don't want to bake the headlight we have another option, the Mini H1 with a special bracket. Fortwo 2007+ butyl Already a projector based headlight. The Bosch projector can be replaced by our E46 Bi-xenon projector. We also have another option, the Mini H1 with a special bracket. Impreza 2000-2003 butyl Large H4 reflector headlight, perfect for a Mini D2S 3.0 projector retrofit with medium to larger sized shrouds. Impreza 2006-2007 butyl Already a projector headlight. The standard projector can be replaced by our Bi-xenon Mini H1 projector with custom brackets. We're currently in need of a test headlight to design a bracket, please contact us if you have this car and would like to have the headlights retrofitted at a discounted price. Impreza 2008-2011 butyl Already a projector headlight. The standard projector can be replaced by our Bi-xenon Mini H1 projector with custom brackets. We're currently in need of a test headlight to design a bracket, please contact us if you have this car and would like to have the headlights retrofitted at a discounted price. Forester 2002-2008 This large H4 reflector has enough room to accommodate the Mini D2S 3.0 with a nice big shroud such as the Apollo 2. The Mini H1 is also a nice option! Swift 2004-2010 butyl Large H4 reflector headlight, perfect for a Mini D2S 3.0 projector retrofit. SX4 2006+ butyl Large H4 reflector headlight, perfect for a Mini D2S 3.0 projector retrofit. Aygo permaseal Large H4 reflector headlight, perfect for a Mini D2S 3.0 projector retrofit with medium to larger sized shrouds. Yaris 2005-2013 butyl Large H4 reflector headlight, perfect for a Mini D2S 3.0 projector retrofit with medium to larger sized shrouds. Yaris 2011+ permaseal Large H4 reflector headlight, perfect for a Mini D2S 3.0 projector retrofit with medium to larger sized shrouds. Golf GTI V 2003-2008 permaseal The Golf GTI Bi-xenon use the Bosch E46 projectors as well. Golf V plus 2003-2008 permaseal Xenon headlights use the Hella projector, EvoX-R is a good choice to retrofit. Passat B6 2005-2010 permaseal H7 projector headlight. For the Hella units, the EvoX-R is a direct bolt on replacement. Headlight has to be opened up to remove the projector. Passat B7 2010+ permaseal H7 reflector headlight. Will fit nicely with our larger shrouds, since these headlights are pretty large. Transporter T4 1990-2003 butyl H4 reflector headlights. For the halogen H4 headlight, the Mini D2S 3.0 is the best choice with a larger shroud. For the H7 multivan headlights the Mini H1 is the best choice with Pegasus shroud. Touran 2007-2009 These headlight are from the category of "easiest to retrofit". These Bosch/AL headlights are already equiped with projectors. The projectors can easily be removed from the rear opening of the headlight, it's not necessary to bake them open. The original H7 halogen or D2S xenon projectors are okay, but nothing spectacular. The reflectors from the Bosch/AL projectors are known to burn after the years, reducing the light output. The only option is the Mini H1 projector with a special RFL made bracket for easy bolt on fitment. S40/V40 1999-2004 Butyl This car has H7 halogen headlights which can be retrofitted pretty easy with our mini H1 Projectors with a mini Gatlin Gun Shroud. XC90 2002-2012 permaseal Mini H1 projector. R1200GS all permaseal We tried to retrofit this headlight but it seems almost impossible to open this unit. The only choice seems to be plug & play xenon. This will of course cause glare, so that's not recommended when you drive at night time. 848 all permaseal Perfect for our Retroquick kit, contact us to order. 1098 all permaseal Perfect for our Retroquick kit, contact us to order. 1198 all permaseal Perfect for our Retroquick kit, contact us to order. V-Rod all permaseal Headlight is not deep enough for a normal projector installation, needs custom mounting. CB1000R all butyl H4 headlight. We developed a special bracket to fit the Mini D2S 3.0 inside this headlight. CBR1000RR all butyl These H7 headlights do not have enough depth for projectors. We designed special mounting brackets which replace the reflectors, making it possible to fit the Mini H1 projectors with mini gatling gun shrouds. NC750 / NC700 all butyl Perfect for the Mini D2S 3.0 with a larger size shroud. ER6-F 2009-2011 butyl These H7 headlights do not have enough depth for projectors. We designed special mounting brackets which replace the reflectors, making it possible to fit the Mini H1 projectors with mini gatling gun shrouds. ER6-F 2012+ butyl These H7 headlights do not have enough depth for projectors. We designed special mounting brackets which replace the reflectors, making it possible to fit the Mini H1 projectors with mini gatling gun shrouds. ZX-6R 2003-2004 butyl H7 halogen reflectors. Perfect for Mini H1 with mini gatling gun shrouds. Space is tight, Mini AE does not fit. ZX-6R 2005-2006 butyl H7 halogen reflectors. Perfect for Mini H1 with mini gatling gun shrouds. ZX-6R 2007-2012 butyl Already a projector headlight. We designed specific brackets for this headlight to mount projectors. ZX-9R 2000-2004 butyl Large H4 headlight, perfect for Mini D2S 3.0 Bi-xenon projector. ZX-10R 2006-2010 butyl Already a projector headlight. We designed specific brackets for this headlight to mount projectors. GSF1250 Bandit 2007-2012 butyl H4 headlight. We designed a specific bracket for this headlight to fit the Mini H1 Bi-xenon projector with E46-R extended shroud. GSF650A Bandit 2009+ butyl H4 headlight. We designed a specific bracket for this headlight to fit the Mini H1 Bi-xenon projector with E46-R extended shroud. SV650 all butyl H4 headlight. The Mini H1 will fit tight with the mini gatling gun shrouds. 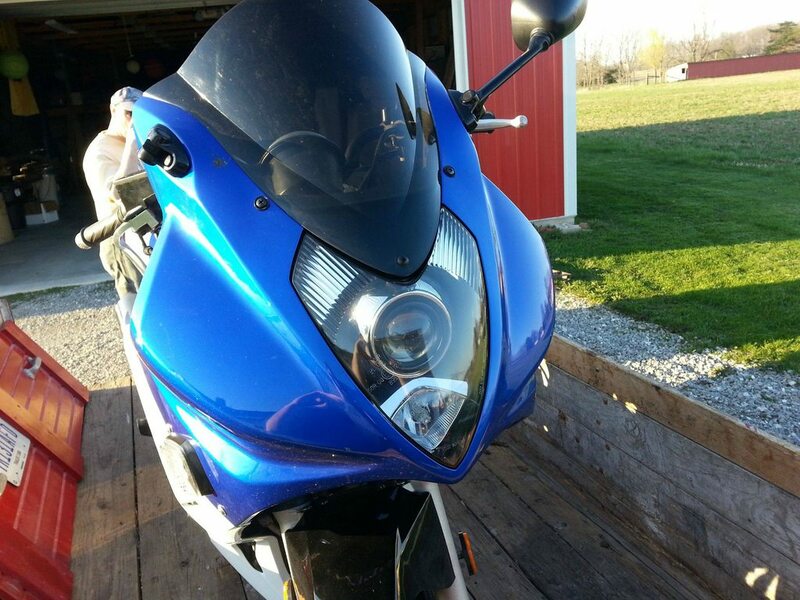 SV1000S all butyl H4 headlight. The Mini H1 will fit tight with the mini gatling gun shrouds. MT09 / FZ09 2013+ butyl Perfect for our retroquick kit. R6 2006-2014 butyl We developped a bracket for the Mini H1 projectors which replace the standard reflectors. This kit is available here. Heeft u meer informatie over een auto of motor die nog niet in de lijst staat? Laat het ons weten!